Since the first day the new Aquaero has been introduced, many potential buyers and the one who was lucky (or not) to get the device first have wondered what max load can be applied to a single fan control channel? What temperatures are considered as “normal”? etc. This ic closely connected with technical implementation of Aquaero 5. In fact, device specification indicates that each of four main control channels can handle load from fans/pumps with current not bigger than 1.65A per channel. But here we see another limitation — overall current consumption per device should not exceed 5A. This means that you can fully load only three of four fan channels. But even that is hard to achieve as manufacturer recommend to connect power hungry devices (pumps, fans, etc) to side channels (1 and four) to avoid overheating issues of power IC. And overheating is so big that it even requires the help of water cooling systems to hold the specified 5A load. How good the waterblock option is against the aluminum heatsink supplied with XT version will be discussed later. Right now we will share some details on electrotechnical side of Aquaero 5. The electrical part of Aquaero 5 has been noticeably improved. For example, the new controller can give readings on power voltage and current consumption of devices connected to Aquaero 5. How accurate are those readings is the next question to answer. For that, we connected two multimeters to fans connected to Aquaero. Connecting more fans in parallel we were gradually increasing the load per single fan channel. By comparing the data we got, we calculated the inaccuracy of readings and voltage drops of nominal values. All the info collected is tabulated below. Red and Blue values indicate max and minimum value deviations. Power consumption was calculated using multimeter data. During this test we used San Ace 109R1212H1011 fans with real consumption current of 0.51А, which creates almost 6W of load at 100% speed. In theory, this would allow us connect only three fans per single channel. Things were different in practice. Aquaero 5 single fan channel could handle the load of five! such fans (equal to 30W), moreover, we could even downvolt all of them to 5v. On the other hand, real current consumption reached 1.63 A (so close to specs) with voltage drop amounted to 1.5V with is a lot to our mind. Average voltage reading error is around 5%. As for current, thins are not so pretty — average error is 10%, but some time can exceed 25%. Leaping ahead we should note that power IC temperature reaches its max value with fans running at 6-7 V. In our case, four fans and a passive heatsink has resulted in more than 85°C. So the following testing was done with a fan airing the heatsink. Aqua Computers has not changed its principle and same as with Aquaero 4, the new controller uses analog control schematics. One of its major drawbacks is excessive transistor heat generation. This is why company pays close attention to the cooling of power ICs. In this test, we had several power consumer connected to controller with overall current 3.73A according to Aquasuite 2012. Considering the average 10% reading error for currents that figure turns into 4 A of real current — 80% of max allowed load. Next we decreased power voltage step-by-step from 12 to 5 volts, while collecting the data from built-in temperature sensors. These actions were repeated three times for different cooling conditions. As you seen passive heatsink is no the right the way to go with such a load. At the point where power transistors generate the most heat (fans at 6-7 V), temperature sensor readings hit almost 90°C, however, safety feature was not triggered. According to information we have, the automatic safety function turns on at when power IC temperature exceeds 95°С mark, whereupon fans run at full power till temperature drops below 70°C. Active heatsink has improved thermal condition of power transistor, with max temperature not going above 65°C. In our test waterblock showed similar to that performance except for more faster temperature stabilization. 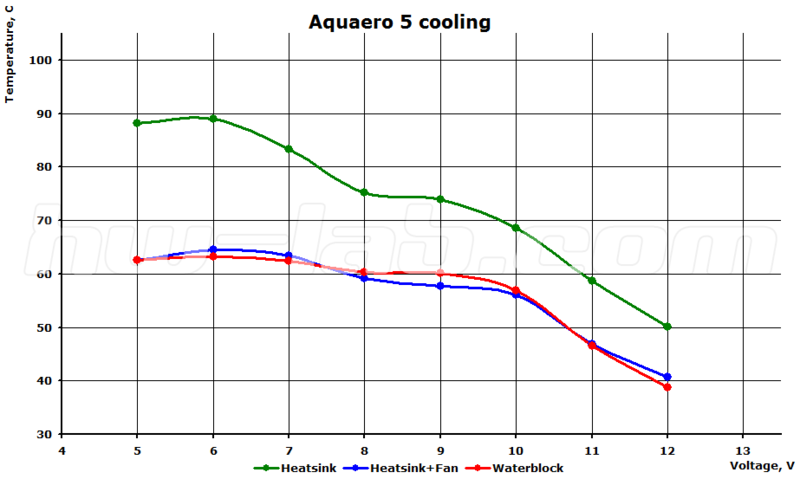 On the other hand, flow rate has dropped from 670l/h to 575l/h for LC loop with and without Aquaero 5 waterblock in it. To conclude, we recommend Aquaero 5 waterblock as an cooling option for user that already have experience with Water Cooling. However, with a sufficient airing of a heatsink, it can fulfill its job quite well. Disadvantages in both cases are caused by cooling system mounting inside chassis: a fan behind Aquaero 5 can block access to neighboring 5.25″ bays, while waterblock requires tube routing to controller witch already lots of wires going to it.